I created this page so that I may share my electronics, Raspberry Pi, Linux, Python and Java projects with others. Have tried to write some documentation to explain usage of the projects. 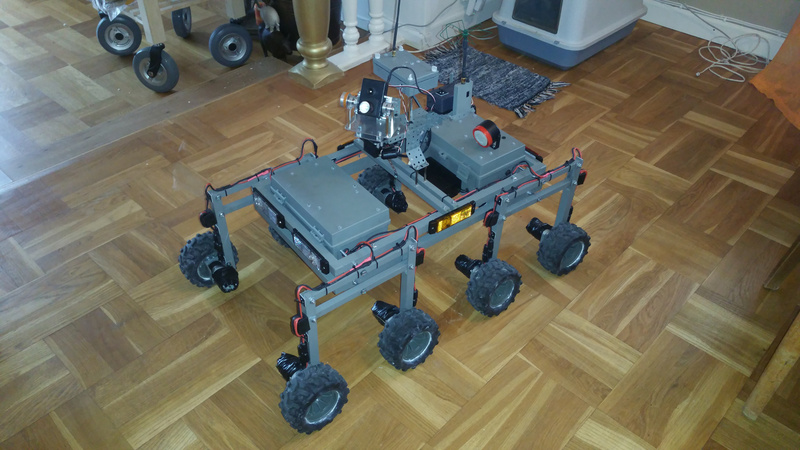 Robot rovers controlled by a HTML page. Expansion board for Raspberry Pi. A minimal and optimized version of Raspbian, perfect for your I/O projects. 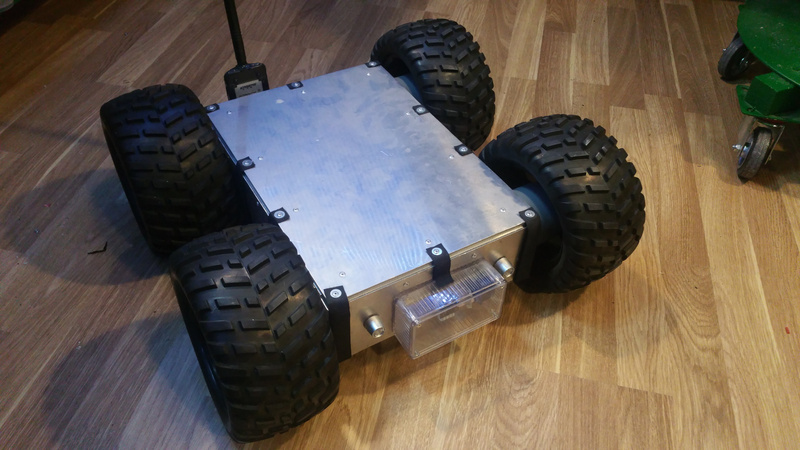 I have redesigned my Irrbloss 4G Rover, it is bigger and not as top heavy as the old one. The camera is located slightly behind and quite high up on the rover to get a better view when driving. This one is also more rigid and stronger. I use the same control station with some modifications. 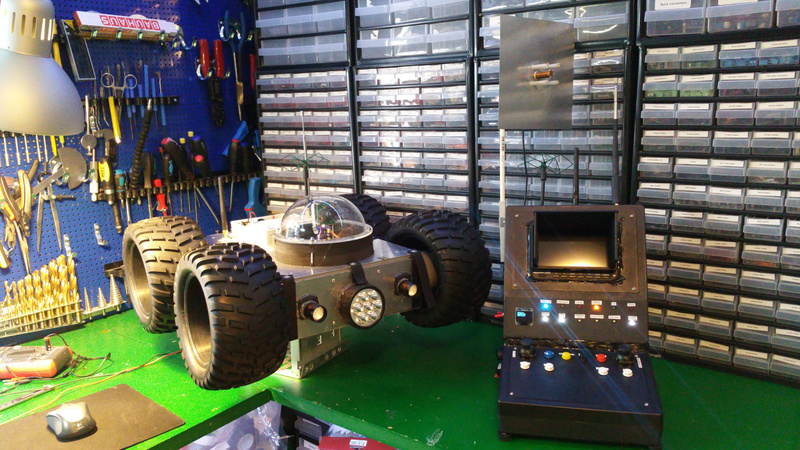 This new rover is small and weighs about 11kg with the batteries. The base chassis is made from Servocity 6WD Mantis but with larger wheels. And it is reinforced to withstand the weight. It is controlled by 4G or WiFi from a new control station. So I can drive everywhere where there is 4G coverage. This is my new project Squidscout. It is a 6wd rover with rocker suspension. I did not like the skid steering from my last rover so this one can turn the front and rear wheels. 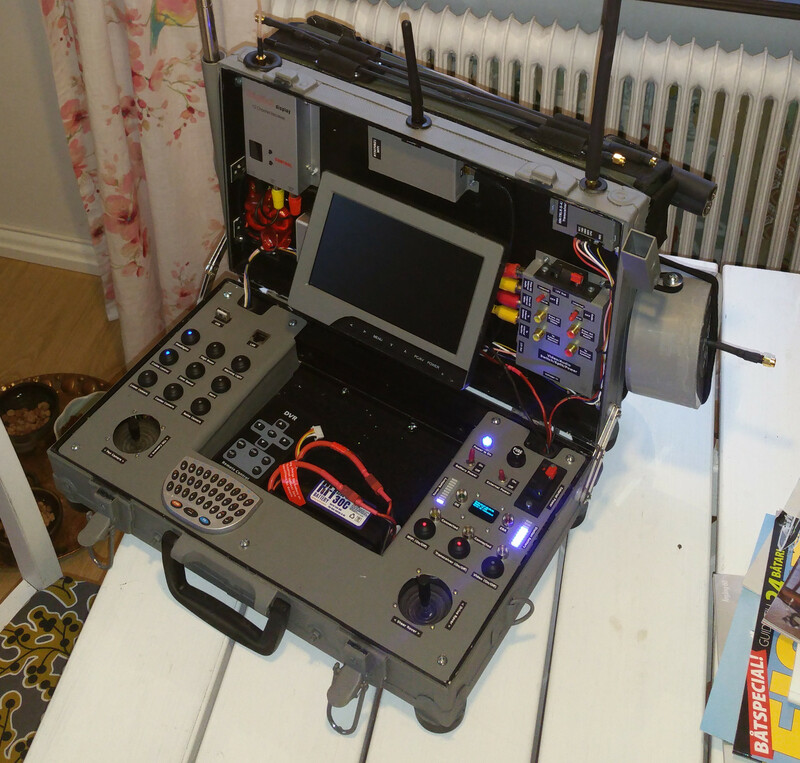 It is controlled by my FPV Control Station. Built a new control station for my rover. 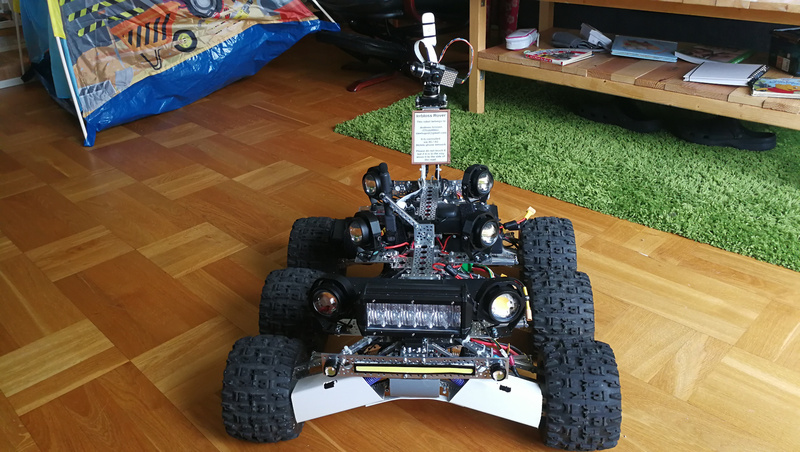 It work with my old rover: FPV Rover but i work on a new rover with 8 wheels and suspension. 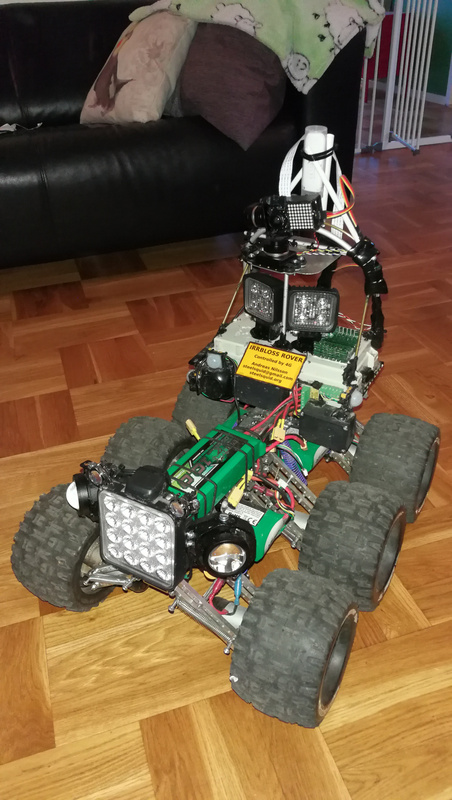 I have rebuild my Large Rover to the FPV Rover. 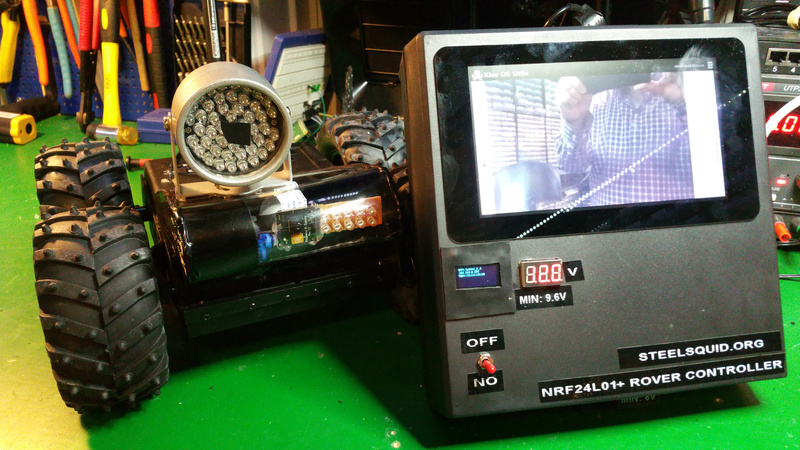 It has a 2.4GHz video transmitter and the video can tilt up/down and right/left. I also made a remote control to host the screen for the video and the control buttons.. I wanted a rover with longer range (WIFI is to short). In this robot the video and control signals is transferred by NRF24L01+. The video is very low resolution and frame-rate (320x240, about 1 frame a second). This is my smallest robot 20x20cm and 9cm hight. You can control it via WIFI like the other robots but this also has 8 HC-SR04 distance sensors. 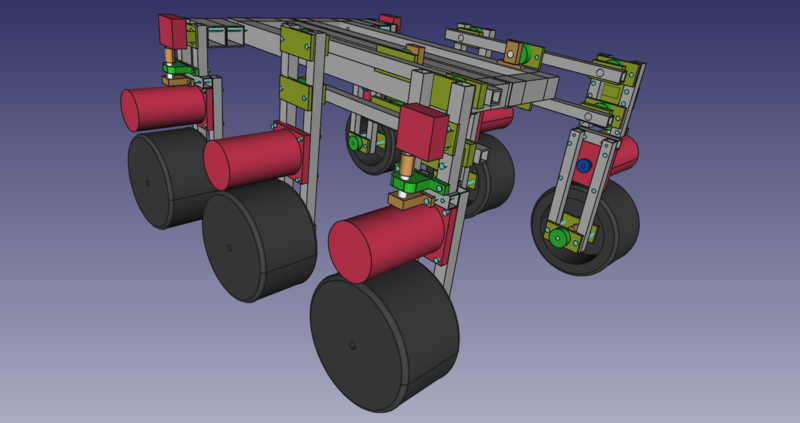 It is about 50x50cm with 20cm wheels and uses PiBorg Diable DC motor controller. 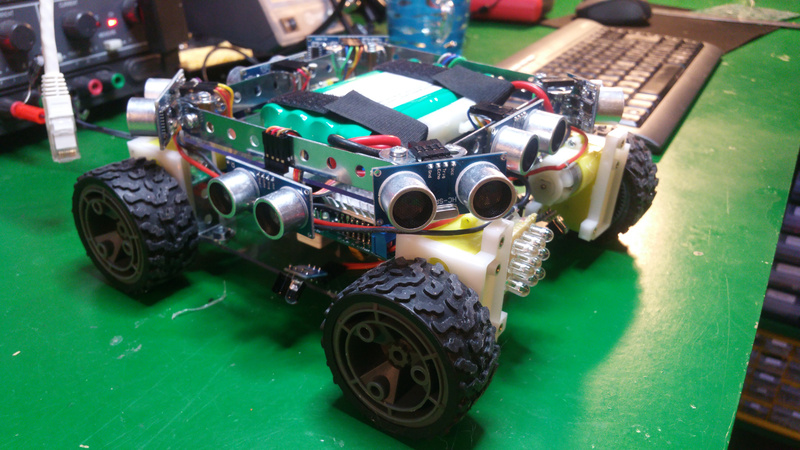 It has the same control system as the Small Rover but it do not use the internal DC motor controller. Control it on a HTML5 webpage via WIFI. Drag on the right side of the screen with your mouse or your finger to control the movement. And drag up and down on the left side to tilt the camera. Double tap on the screen to toggle the light. My expansion board for the Raspberry Pi is finally finish. The board is 120x100mm and is connected to the Raspberry Pi with a female PIN header and two 18mm spacers. New version of Steelsquid Kiss OS (v1.1). Super fast boot about 10 seconds. This is a example project how to use Steelsquid Kiss OS to control a 10 LED bar, two buttons and the built in WEB-server. Press the upper button to light one more LED until all lights. Press the lower button to decrease the number of glowing LEDs. The bottom LED should never be extinguished when you push down button. I also want a simple WEB interface that also can control the LED bar in the same way. And finally all LEDs should illuminate on network connected. And no LED lit on network disconnect. Flash all LEDs when there is a file in the /root directory named flash. And then delete that file. Finally a 1.0 version of Steelsquid Kiss OS. And also a windows EXE for the synchronization script. The Steelsquid Kiss OS Alarm/Surveillance functionality. Connect different sensors to monitor your house or other thinks. Clay target thrower remote that i built for a colleague. How to develop and extend functionality of the Steelsquid Kiss OS. You can easily configure WIFI and other stuff from command line and a web interface. It contains no desktop environment. 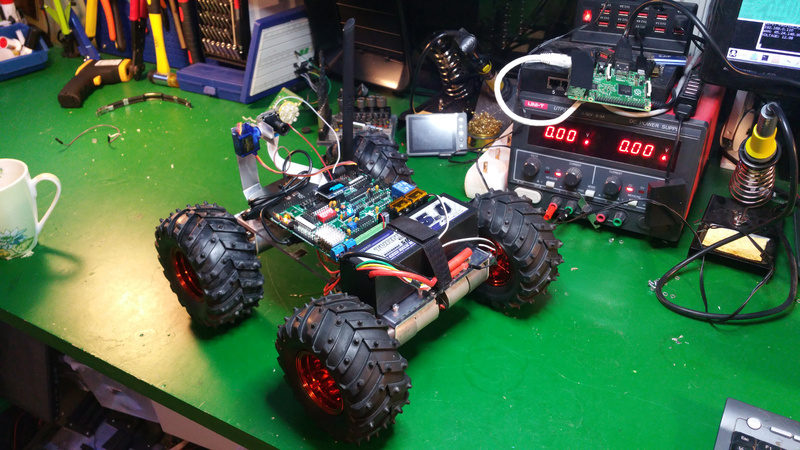 Building a 4WD robot controlled from an Android app. This is an experimental board that I built as a birthday gift for my brother. Monitoring and control an old pellet feeder. A Spotify audio playing device that can be controlled via Bluetooth from your Android phone. The unit will act as a server so that different Bluetooth devices can connect and control it. The server part running on Debian Linux. It is written in Python.